We just concluded our parish feast of Corpus Christi at the beginning of last month but we can never have enough of the (“topic of the”) Eucharist. We are indeed blessed to know that the liturgy treats us this Sunday with a prefiguration of the Eucharist in the miracle of the multiplication and on the next four Sundays of August, we will hear the great discourse of our Lord in the synagogue of Capernaum in which He reveals Himself as the Bread of Life. But before we consider the familiar story in the gospel, let us take a look at the first reading which is taken from the Old Testament. The great doctor of the West, St Augustine taught that the New Testament is hidden in the Old and the Old is made manifest in the New. We see this in the two narratives found both in the First Reading and the Gospel. Our Lord was not the first to miraculously multiply loaves. The prophet Elisha worked a similar miracle. The first reading describes a hungry crowd, someone bringing forth barley loaves, and another objecting that the bread is too little for the large crowd. In both accounts, all the people were able to eat their fill; there was a multiplication of the loaves and there was bread left over. Of course the juxtaposition of these two parallels is meant to highlight that our Lord’s miracle is superior to that of Elisha’s. While Elisha had 10 barley loaves, our Lord only had 5 loaves and 2 fish to work with. The crowd in the first reading was only about 100 whereas the multitude in the gospel story would have exceeded five thousand, not counting the women and children. In the first reading, there was just a perfunctory footnote that “they ate and had some (left) over,” whereas the left over from Jesus’ miracle filled twelve baskets. In the Gospel miracle, Scripture scholars have identified another level of meaning in the multiplication of the loaves and fish: a Eucharistic meaning. The early Christians definitely recognised the connexion between the multiplication of the loaves and the Eucharist. In second-century catacombs, we find artistic representations of the miracle of the multiplication of the loaves to symbolise the Eucharist. Already in the four Gospel accounts of this miracle, we see a strong Eucharistic motif. We find the same verbs used describing Jesus’ action at the miracle, as are used in the account of the institution of the Eucharist at the Last Supper: He “took the loaves (bread), gave thanks, and gave them out (distributed).” The verb in Greek for giving thanks, “eucharistein”, became the word the Christians used for the sacrament: Eucharist. When the people had their fill, Jesus told the disciples to gather the fragments that were left over so that nothing would be wasted. There was also in the early Church, great care taken with the Eucharistic fragments that were left over. Unlike many Protestant churches, the consecrated host left over from Holy Communion is never just simply discarded as if they no longer have any significance. They are carefully and reverentially conserved and reposed in the tabernacle of the Church, because they continue to be truly, really and substantially, the Body and Blood, Soul and Divinity of Christ. Today, I would also like to draw your attention to a little point made in both multiplication narratives. Both Elisha and our Lord worked with material offered by someone, an anonymous man hailing from Baal-Shalishah in the first instance and an anonymous boy in the second. Their anonymity may be a clue pointing to the fact that they are representative of any person willing to make a small humble offering to the Lord. In other words, both Elisha and Jesus did not just conjure the original substance of their miracle from thin air. This should also draw our attention to something said in the course of our celebration of the Eucharist. 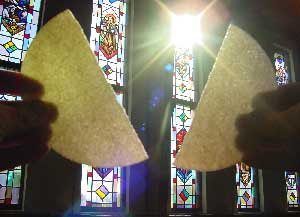 During the part of the Preparation of the Gifts which begins the Liturgy of the Eucharist (popularly and inaccurately known as the Offertory), the priest takes the bread and recites these words (quietly if an Offertory Hymn is being sung), “Blessed are you, Lord God of all creation, for through your goodness we have received the bread we offer you: fruit of the earth and work of human hands, it will become for us the bread of life” and similar words are used when he raises the chalice. We are reminded through these words that these gifts of bread and wine which we offer are first and foremost gifts in themselves which we have received through God’s goodness. But both bread and wine are also “the work of human hands” always remembering that we would have nothing to offer apart from His goodness. Now, in expectation, we speak of what this bread and wine will become: the bread of life and our spiritual drink. God will take this thing that we offer and will change it yet again, this time into something that we could never make it: the body and blood of Christ. This prayer reminds us that we are collaborators with God in His work of creation, but more so in His work of redemption. He has given us this world and filled us with the grace to care for it and develop it, turning potentials into beautiful realities as we turn grain into bread and grapes into wine. But both these things remain perishables. However, there is one way in which the fruit of our labours can be eternal; we can offer them to God. They will remain perishable, unless God takes the work of human hands and once again makes it something better, imperishable food. Our efforts can only be brought to perfection, to heavenly fulfilment, if we place them back in the hands of God.